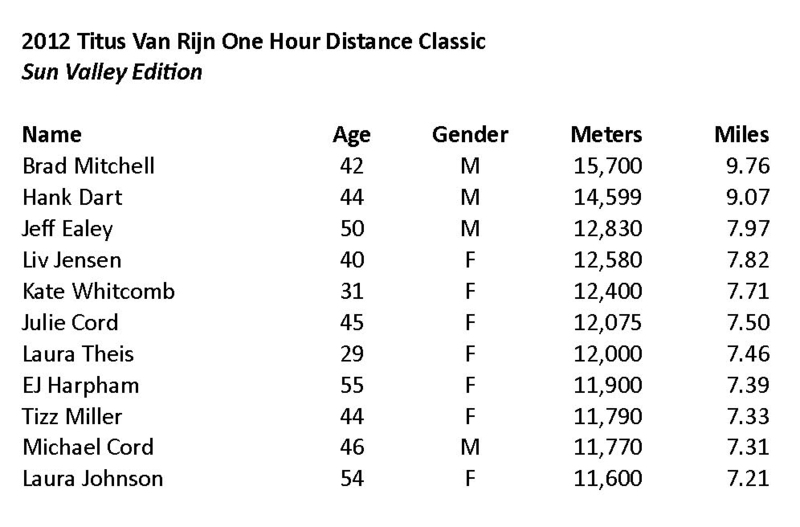 There are but a few key spring waypoints on the route to the trail racing high season, and one of them for Sun Valley-area runners is the 60 minute time test on the track that is the Titus van Rijn 1-Hour Distance Classic. With no where to hide from wind, clock, or peers, it provides an unvarnished picture of just where one's mental and physical fitness lies ahead of summer's plans. So, under unstable skies, eleven brave runners toed the line, with events playing out pretty much true to form of previous years. Despite taking the group around the first lap at 4:30 pace, Brad Mitchell - on a stripped down three run per week training schedule - settled in and took the overall with an impressive 15,700 meters (9.76 miles). 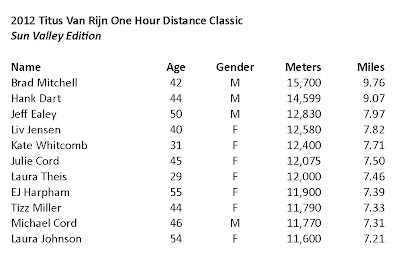 Liv Jensen - new to the 40 and over age group - took the women's overall title with 12,580 meters (7.82 miles). Full results and photos below. Good will and black cherry soda were, as always, abundant at the after party. The only thing missing - prodigal son AJW and his split side fish shorts. Except for post-run images, all photos by Anne J.